PolyM first put in an appearance last year, when XILS-lab clearly considered those oft-overlooked Polymoog presets to be well worth revisiting, recreating an ‘unlimited’ polyphony polysynth that was recognisably revolutionary upon its initial release and making it fit for today’s creative computer-based music-makers with a state-of-the-art software makeover. Making that happen took two years — such was the complexity of its inspirational hardware predecessor. PolyM palpably didn’t disappoint, deftly reproducing yesteryear’s divide-down technology with two TOD (Top Octave Divider) oscillators — one for the sawtooth wave and another for the square, slightly detuned for a phenomenal phasing effect (when running independently in FREE mode), yet taking the concept further forward by adding polyphonic pulse width modulation. Meanwhile, in LOCK mode, those two TOD oscillators are almost locked in phase, producing PM (Phase Modulation) instead of FM (Frequency Modulation) when the square wave oscillator is modulated in pitch. The two TODs can also be modulated — tempo-sync-able — in pitch by an LFO (Low Frequency Oscillator), while the square wave oscillator has it own pulse width modulation by a tempo-sync-able LFO. Alongside a distinctive envelope generator, this represents the musical heart and soul of PolyM, pushing that revolutionary polysynth sound kicking and screaming into the future! Further features of note include: 71 emulated chips, offering mixer, VCA (Voltage-Controlled Amplifier), envelope, 12dB filter, and pulse width modulation for each of the available notes; stunning-sounding 24dB ladder filter (using XILS-lab’s critically-acclaimed zero-delay algorithm); nine dedicated acoustic filters — STRING, PIANO, ORGAN, HARPS, FUNK, CLAV, VIBES, BRASS, and VOX — carefully recreated from the original (model 203a); RESONATORS filter bank with three parametric (6dB and 12dB) filters matching the original; three vintage — DEL. (delay), PHAS. (phaser), and REV. (reverb) — effects (with adjustable settings from within an Advanced Settings Panel alongside nine modulation slots for furthering sound design possibilities well beyond the scope of the original hardware); and more. Today, thanks to the PolyM 1.1.0 update, there’s even more to (literally) make a song and dance about. As such, the NPM (New Preset Manager), a newly-integrated, single-window affair allowing users to easily and speedily perform different tasks with welcomed visual feedback — for example, locate and load the best fitting preset in seconds courtesy of a multi-criteria search engine, save/save as presets with (user-generated) tags, batch-tag multiple selections of presets, export/import multiple selections of presets, and select view (such as showing only favourite presets) — represents a major step in PolyM’s evolution; by that same token, those acoustic filters and RESONATORS, as well as the three vintage-sounding effects, are also available to work with other sound sources when running PolyM purely as an effects plug- in proffering plentiful possibilities for modulation; meanwhile, support for Native Instruments’ NKS® extended plug-in format for all virtual instrument developers delivers intuitive and seamless interaction with the German giant’s cutting-edge KOMPLETE KONTROL S-Series keyboards and MASCHINE hardware. Helpfully, there are now over 300 professionally-programmed presets available as creative kickstarters in PolyM; parameters are all MIDI- controllable, combining to musically position this soft synth par excellence as an innovative instrument of its time while retaining a certain pioneering polyphonic analogue synthesizer’s coveted performance properties of the past. Put it this way: while what the deceased Austrian neurologist (and founder of psychoanalysis) Sigmund Freud would have made of this polysynth hommage is obviously open to speculation, surely the still active Gary Numan should approve… as will anyone’s bank balance by paying (comparatively) so little for so much playing pleasure. Thanks to its welcomed 1.1.0 additions, PolyM pushes beyond the pleasure principal in both senses, so anyone wishing to sonically travel back to the future should seriously consider adding it to their soft synth arsenal — all the more so at an attractive (albeit time-limited) introductory promo price representing a welcomed 40% saving. Best be quick, though — time waits for no man… or woman (or child)! Based in Grenoble, France, XILS-lab is an audio software company, created and managed by Xavier Oudin. Having created some of the best known virtual instruments and effects plug-ins on the market for various companies over the last 20 years, today he focuses on bringing his passion for audio, instruments, and music to bear on his own company.Working with highly-skilled professional musicians and sound designers, the company collectively believes that a virtual instrument or effect is not simply a series of mind-boggling mathematical algorithms designed and scrutinised over by bookish PhD engineers but rather a useful and useable musical tool made for musicians. Moreover, XILS-lab loves to create virtual instruments and effects that inspire its users to create more imaginative music than they ever dreamed possible! Native Instruments acquires Loop Loft! Berlin 24th Jan – Native Instruments today announces its acquisition of The Loop Loft, a leading content library specialised in recording top musicians to make the highest quality digital content available to all music creators. The move coincides with the launch of Sounds.com, Native Instruments’ new online platform for loops, samples, and sound packs for music creators of all genres with over 500,000 sounds at launch, from more than 200 partners. Sounds.com subscribers can access loops and samples from high calibre drumming and acoustic artists like Nate Smith, Matt Chamberlain and Omar Hakim, further diversifying the platform’s content offering. The move also sees The Loop Loft Founder, CEO and accomplished musician Ryan Gruss joining Native Instruments as Director of Products – Content, based in Los Angeles. In the new role, Ryan will create content for Sounds.com as well managing a specialized development team focused on creating new content across the NI portfolio. The Sounds.com beta launched on January 17 in the U.S. Customers can try it now with a free selection of loops and samples, or go Pro and subscribe to the full library at a special introductory price of $9.99 per month. Simplicity and ease-of-use are central to the Sounds.com experience: All loops and samples are available to browse and preview, with no sign-up required; sounds are tagged and easily sortable by genre, key, BPM, and other attributes; and search functionality is powered by Native Instruments’ own MIR (Music Information Retrieval) algorithms, which helps users find exactly what they need, when they need it. More details about the platform’s vision and progress will be shared with media and industry peers at the ‘Native Summit’ partner conference, held at this year’s NAMM event in Anaheim, CA, from January 25-26. If you are interested in attending, please get in touch with the Native Instruments PR team. Audio Damage freshens its line up with new plugins! 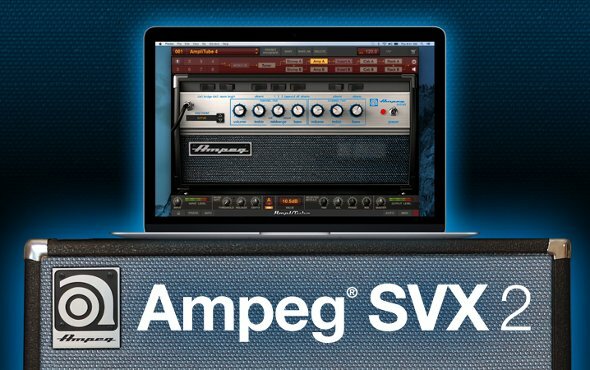 Audio Damage is Has released 3 new plug in VSTs available directly from their site. New versions of the Delay Plug in “Dubstation 2″, Reverb Plug in ” EOS 2 ” and the all new waveshaping distortion “Grind” are now available. EOS 2 consists of four high-quality custom-designed reverb algorithms, made with the modern production environment in mind. Three different plate simulators and Audio Damage’s own Superhall algorithm give you a broad palette of reverb, and the easy-to-understand interface makes adjusting the algorithms to suit your track incredibly simple. The original dub delay plugin and still the best! Dubstation 2 takes our most popular product and adds a whole raft of new features, including a dual mode for separate control over the left and right delay times, ping-pong, a new feedback saturation algorithm, and an LFO. Along with an all-new procedural and Retina-friendly user interface and (FINALLY!) ProTools compatibility, this represents a major leap forward for one of our signature products. All those bells and whistles aside, the heart of Dubstation is our painstaking bucket-brigade delay model. 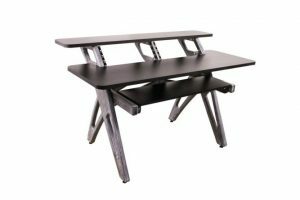 Often imitated, but never duplicated, Dubstation has been the go-to plugin for that sound for over a decade, used in thousands of commercial productions, and with good reason. With the addition of the LFO and saturation controls, Dubstation has moved in to the realm of tape delay emulation as well, and is a sonic Swiss Army knife for delay. A true powerhouse of audio warfare, Grind puts the “damage” in Audio Damage. 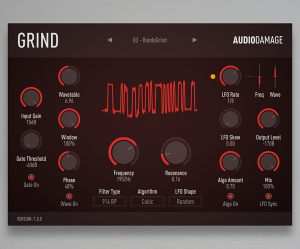 From subtle tube-style saturation to full-on mangled wavetable distortion, Grind is a Swiss Army Knife of sound design. Grind consists of three main blocks: wavetable lookup, in to algorithmic saturation/distortion/, and finally to a multi-mode filter. The wavetable module uses the amplitude of the incoming signal to replace the sample with one from 15 different linearly-interpolated wavetables, chosen for their mangling potential. Window size and phase controls provide further tone-shaping possibilities. The next stop is the algorithm module, with eleven different distortion and saturation algorithms, from simple soft-knee saturation on up to full on sine warping. After this, the signal passes through a multi-mode filter stage, with eleven different filter models to choose from, including “vintage digital” versions from the early days of plugin development, on up to our modern analog-modeled MS20-style lowpass and highpass synth filters. A tempo-synced LFO provides motion for the filter frequency, and a final stage of soft clipping and DC filtering tames the output. Make no mistake: this is not a subtle, polite tool. With careful tuning of the provided presets, it can be tamed to normal filtering and saturation duties, but on the whole, it is a noisy, snorting beast of a plug-in, and is happiest with Full Metal audio destruction. OK enough with the AD copy. I have had some time with all three of these (I even created a group of presets for Dubstation 2). I can say these are a really nice step forward in the Audio Damage line up. The UI is really impoved on these (Grind and EOS2 have some killer front end graphics to help understand whats going on). Grind really impressed me in its filter types as well as how the distortions can take a plain sound and add a ton of movement and character. Similar to the Eurorack module Shapes also from Audio Damage, Grind lets you sequence lookup tables and waveshaping wavetables… very freaking cool. tempo syncing the waveshaping and filter frequency changes is a joy. 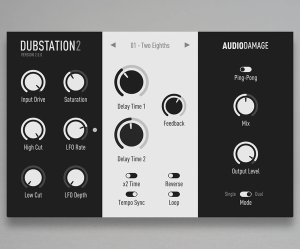 Dubstation 2 is a very straight foward BBD sounding delay that will let you just easily get that dub delay you are after without a cluttered interface. EOS 2 is just a joy to look at and hear. I’ve been using this to create gorgeous synth pads and basically create environments for my instruments to breathe in. The BeatHawk iPad app has been hotly anticipated for some time now. With powerful step sequencing, easy to use sample recording and editing, song arrangement, fx and more. BeatHawk from UVI boasts and intuitive workflow that lends it self greatly to instant hands on creation of beats while on the go or in the studio.